The 2020 event will take place from May 27-June 2. Details of the 7 day experience are outlined below but what they can’t capture is the spirit of this event. A spirit created when inspired and committed individuals come together from around the world to take on and share a profound physical and mental challenge: a gruelling endurance race that will recast your definition of what’s possible and transform the life opportunities of 100s of disadvantaged children. For more experienced endurance runners the chance to join a team event and support newcomers to ultra-running is always a great opportunity to give back. The 7 days together provides time to prepare, connect with your team mates and celebrate an experience amid the best hospitality Bali has to offer. The Bali Hope Ultra has a very limited number of places but is open to both experienced ultra-runners and newcomers to endurance sport and we actively seek a team with great diversity in experience. The Bali Hope Ultra is also a fundraising challenge that requires participants to set out to raise US$5,000. 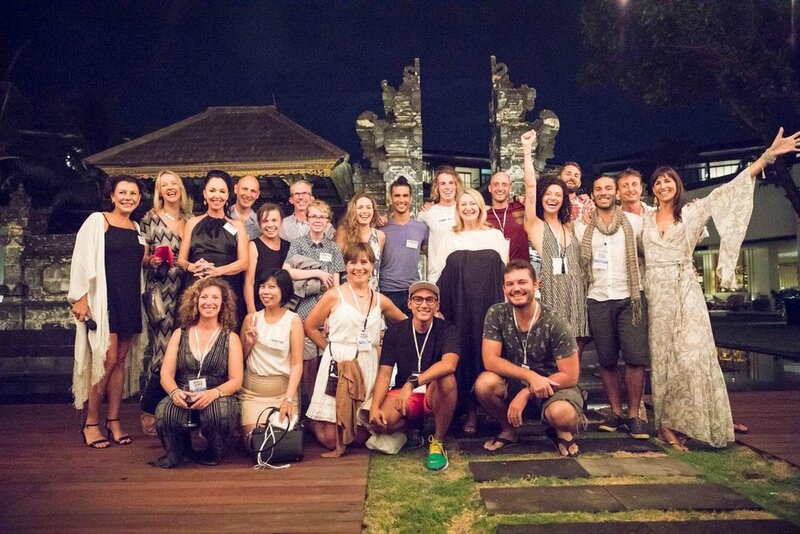 100% of this goes directly to our multi-award winning charity partner Bali Children Foundation. (We do not ask you to make up any shortfall but ask for your best efforts. Some of the team will raise more and others less - the most important thing is the collective impact we make). The 2020 Bali Hope Ultra team will include participants for around the world, ranging from elite endurance athletes to everyday heroes taking on a unique life-changing challenge. We know that this combination works well to create the most positive, supportive and inspirational experience for everyone involved. With a tight know group of just over 30 runners and the time to connect as a group the team spirit has plenty of time to grow. We are also able to provide a high level of personal support Alongside the necessary medical back-up, our support crews provide personalised nutrition and motivational support throughout the 84km route. Our accommodation and hospitality includes the best Bali has to offer and incorporates the 5* Alila Seminyak and the 4* Lovina Bali Resort. Expect a highly curated experience and great service throughout. Check-in from 3pm at The Alila, enjoy an afternoon at the 5* resort and meet your team mates before a welcome reception and dinner in the evening. After months of training, preparation and connecting with your fellow runners online it’s always a great moment connect face to face. The majority of your fundraising is likely to be done and the week of the event is a great chance for a final push. 8:00 - 10:00: Breakfast: Make the most of the delicious 5* buffet breakfast at The Alila as Thursday is quite busy. 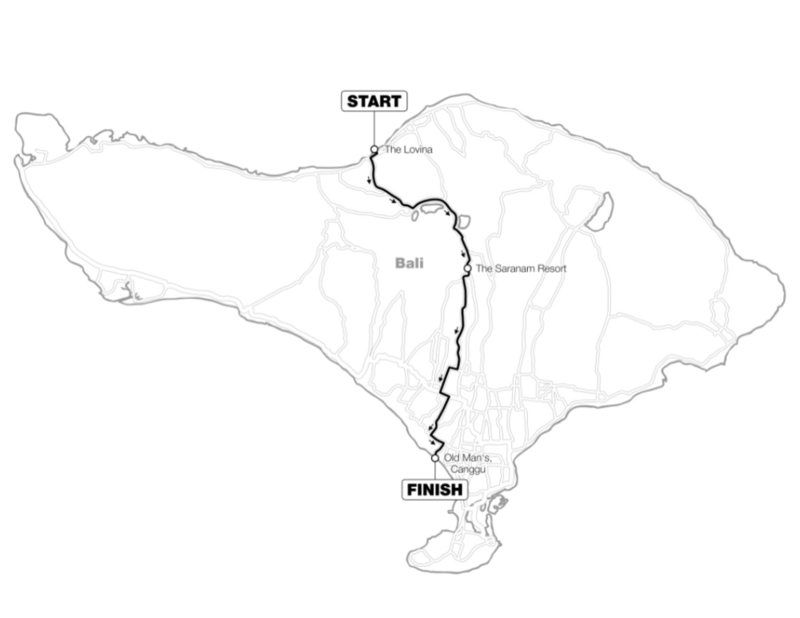 11:00 - 13:00: Review the route of the ultra marathon: After breakfast we drive the route of the ultra marathon in reverse, from the finish line at Old Man's Canggu, to the start line in Lovina. A great chance to get to know the terrain and route first hand. 18:00 - 20:00: Evening Drinks & Dinner: Meet some of the award-winning social entrepreneurs behind our impact partners. Enjoy a delicious breakfast and the early morning calm. 10:00 - 13:00: Today we visit the community and school you have fundraised for in Pedawa, northern Bali. Meet the children and families whose lives you have helped to transform and experience first hand the amazing work of our charity partners. 18:00 - 19:00 Pre-run briefing: At the pre-run briefing our ops team will cover our health & safety protocol and review the environmental factors our runners should be aware of. Take your time to relax, prepare and enjoy the facilities at The Lovina. Make your final pre-race preparations. The runners will join a traditional Balinese blessing to protect them on their overnight ultra while the support crew start to prepare their vehicles and join a final briefing. The race starts at 18:30. Next stop Canggu. As soon as the running team have come in safely we hold a finish line and prize-giving event at Old Man's, Canggu. 11:00 - 18:00: Free time. 18:00 - 22:00: Private team celebration dinner. Breakfast & Farewells: Enjoy a relaxing morning and arrange how to stay in touch with your team mates as we prepare to say our goodbyes. Our team will arrange transport for you to Bali airport or other destinations on the island. Please complete this payment to secure your place on the 2020 Bali Hope Ultra Team. The deposit is non-refundable but can be transferred to another Bali Hope event. Thanks for connecting and for your interest in what we are seeking to achieve with this ultra. We have been so lucky with the amazing people who have joined this event so far and look forward to saying hello. Bali Hope runners are welcome to bring a partner, friend or family member to join us on our 7 day experience and be part of the Bali Hope Ultra support crew. This is a huge part of the shared experience and a powerful experience in of itself, and one we have a waiting list for. A bespoke personalised short film capturing your unique Bali Hope experience. · Why is the event 7-days? 7 days allows us time and space to connect as a group, visit the community we are supporting and celebrate our achievement. Many of our team members will travel to bali from Europe or North America and it is important to acclimatise before the run. · Can i bring a partner and/or children? Of course. Partners and children are most welcome. In 2018 we had 4 young people with us, including one young adult who joined our support crew. Witnessing a team of adults from around the world making change happen for a disadvantaged community can only be a positive experience. · What will they do during the run? That's entirely up to them. We encourage partners and children over 14 years old to join our support crews on the night of the run. This is a profound and enjoyable experience and a place on the support crew is highly sought after. · Can I join the ultra marathon but not the rest of the week? Unfortunately not. The integrity of our running team, our shared experience and our itinerary means this is not possible. · What is your advice if I have never run an ultra marathon before? About half the 2019 team were newcomers to ultra running, some had experienced a marathon and others just 20km. The common characteristic of all these individuals was a high level of commitment to prepare as best they could. · What is your advice on the right training schedule? The support we provide our successful applicants includes access to a detailed training program for different levels of experience. The highly-experienced ultra runner Sam Gash will pass on her expert advice and answer questions through our private team Facebook group. There is certainly not one approach that suits everyone and factors such as your age, current fitness levels, nutrition and mindset are important. · What equipment will I need? Mandatory equipment includes: a head torch, back light, camel pack and smart phone with an additional battery pack. · What level of support do you provide? Runner safety on this open-road race is our key priority. With this in mind we have a highly-experienced health and safety director, emergency medical back-up, and trained first aiders in both fixed and mobile-aid stations. We have fixed aid stations every 10km and a fleet of support vehicles to provide nutritional and motivational support as required. · What insurance do i need? Every runner will need personal travel & emergency medical insurance covering endurance events. · What is your advice on fundraising? Critical factors on successful fundraising include, starting early to raise awareness of what you are doing, the impact it will make and the training commitment required, and then follow this up with personal messages to friends, family and your broader network. For those new to fundraising while US$5,000 may sound like a high target, it is very achievable and you will receive personal support and advice from our charity partner bali children foundation.